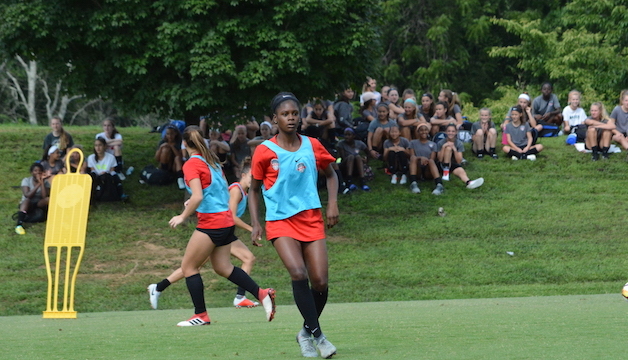 Boyds, MD – Washington Spirit Academy players Jasmine Hamid, Leyah Hall-Robinson and Cami Taylor shared on their experiences this summer, participating in NWSL training alongside some of the world’s top professional and international talent. Several players in the U-18/19 age groups of the Spirit Academy – Virginia and Maryland programs have had the opportunity to regularly participate in NWSL training sessions beside U.S. Women’s National Team stars Mallory Pugh and Rose Lavelle, and the rest of the Spirit professional squad. The Spirit Academy is currently seeking players for the 2018-2019 season. Interested players should contact Virginia Director Tom Torres (TTorres@WashSpirit.com) or Maryland Director Santino Quaranta (SQuaranta@WashSpirit.com). To learn more about the Spirit Academy, visit washingtonspirit.com/da. Spirit Academy forward Leyah Hall-Robinson is spending her @ussoccer_acad offseason training with @MalPugh and more of the world's top players.